Mayana is a shared common name of (1) Coleus atropurpureus, badiara, and (2) Coleus blumei. Some compilattions list the two species as synonymous. 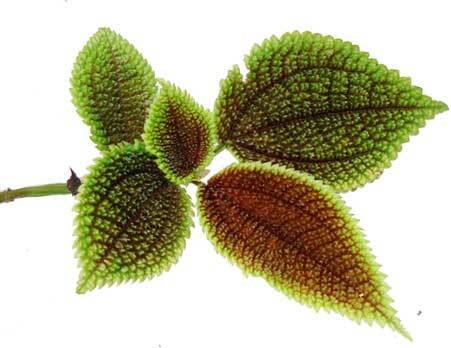 Quisumbing's compilation lists Coleus blumei (Mayana) as synonym of Plectranthus scutellarioides Blume. Quisumbing's compilation lists Coleus atropurpureus (badiara) and Coleus blumei (mayana) as separate species. More recent compilations list the species as synonymous. K. Heyne does not separate it from C. blumei (now Solenostemon scutellarioides). - There was a report of psychoactive use among the Mexican Mazatecs discovered in 1962 in connection with Gordon Wasson's research into Salvia divinorum. - There are a large number of Coleus blumei hybrids which can be mistaken for other Coleus species. Mayana is an erect, branched, fleshy, annual herb, about 1 meter high. Stems are purplish and 4-angled. Leaves are variously blotched or colored, usually more or less hairy, ovate, 5 to 10 centimeters long, rather coarsely toothed in the margins; and in the most common form uniformly velvety-purple. Flowers are purplish, numerous, and borne in lax, terminal, simple or branched inflorescences, 15 to 30 centimeters long. Calyx is green, and about 2.5 millimeters long, with the upper lip ovate and the lateral lobes short and ovate, the lower one being 2-cleft. Corolla is about 11 millimeters long. - Popular for its incredible range of foliage colors. - Now, a pantropic ornamental. - Leaves reported to yield psychoactive material. - From the leaves, study isolated a mixture of sterols and triterpenes, campesterol, α-amyrin and ß-amyrin. - Yields salvinorinlike substances of undetermined chemical structures. - Screening yielded flavonoids, sterol and triterpenoid compounds. - Studies suggest antimicrobial, antioxidant, anthelmintic, antimalarial, phytoremediative analgesic, anti-inflammatory properties. • In the Philippines, pounded leaves used as a cure for headaches, applied to the temples or nape of the neck. Also used for healing bruises. • Decoction taken internally for dyspepsia and for wasting away. • Decoction used as eye drops for ophthalmia and conjunctivitis. • Bruises and sprains: Crush or pound 10-12 leaves and apply over the ankles, wrists or affected areas for 30 minutes, three times daily. Use a bandage to hold the poultice in place. • Carminative: Take decoctions of leaves. • Mild bleeding of wounds: Wash the young leaves; crush and extract the juice. Drop a few drops of the juice directly on the wound. Apply the crushed leaves as poultice. • Sinusitis: Heat 10-12 fresh leaves over a fire; apply while still hot over the forehead for the frontal sinuses or over the cheeks for the maxillary sinuses, twice daily. • Dyspepsia: Decoction, taken internally. • Reported use in Asian traditional medicine for asthma, angina, bronchitis, epilepsy, insomnia, skin rashes and various digestive problems. • In Samoa, used to treat elephantiasis. • In Southeast Asia, used to treat dysentery and various digestive problems. • Psychoactive: The psychoactivity of the leaves is highly controversial. (1) There are reports of psychoactive effects from the smoking of leaves. Leaves are dried and soaked alone or mixed with other herbs, and the psychoactive effect achieved with as few as 3 leaves. (2) The Mazatecs consider coleus as a member of the "family" of psychoactive herbs, using coleus as a substitute for Salvia divinorum. (3) About 30% of subjects who smoked dried Mexican Coleus blumei leaves reported effects similar to smoking a small dosage of Salvia divinorum. (4) Some experience no effects with large amounts of leaves. • Forskolin / Erectile Dysfunction: Study has shown forskolin may enhance smooth muscle relaxation. Studies are needed to assess the use of coleus in the treatment of erectile dysfunction. • Antibacterial / Antitumor: An ethyl ethanoate soluble separate of an ethanol extract showed antibacterial and anti-tumor properties. - Ornamental cultivation for its colorful leaves. Sorting Plectranthus names / /Maintained by: Michel H. Porcher / MULTILINGUAL MULTISCRIPT PLANT NAME DATABASE / Copyright © 1995 - 2020 The University of Melbourne. Maternity and medicinal plants in Vanuatu I. The cycle of reproduction / G. Bourdy and A. Walter / Journal of Ethnopharmacology, 37 (1992) 179-196	179 Elsevier Scientific Publishers Ireland Ltd.